Posted on August 20, 2013 by Dayna B. 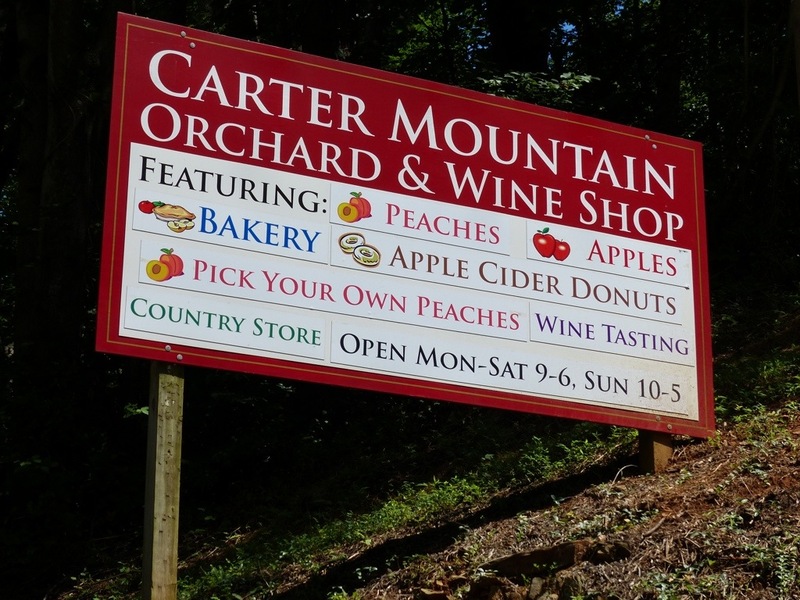 Just down the road from Monticello is Carter Mountain Orchard. 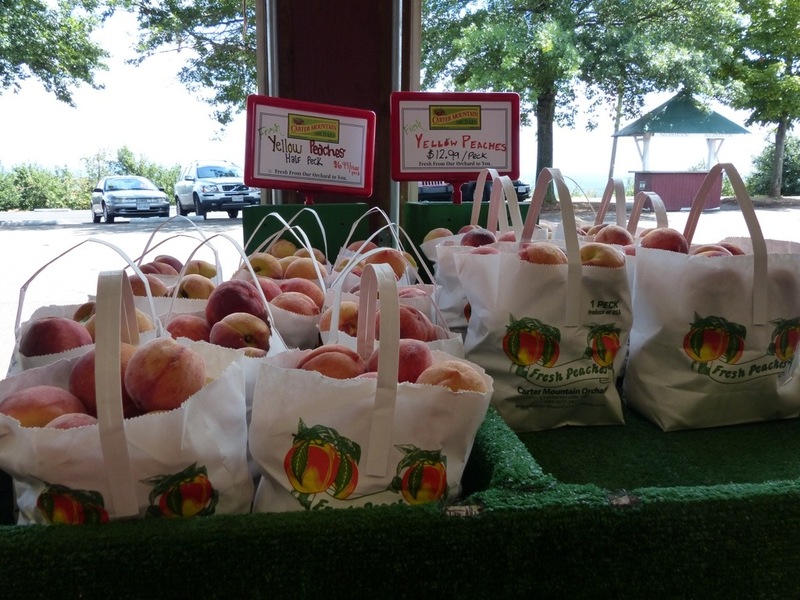 Their sign advertising fresh peaches reeled me right in! 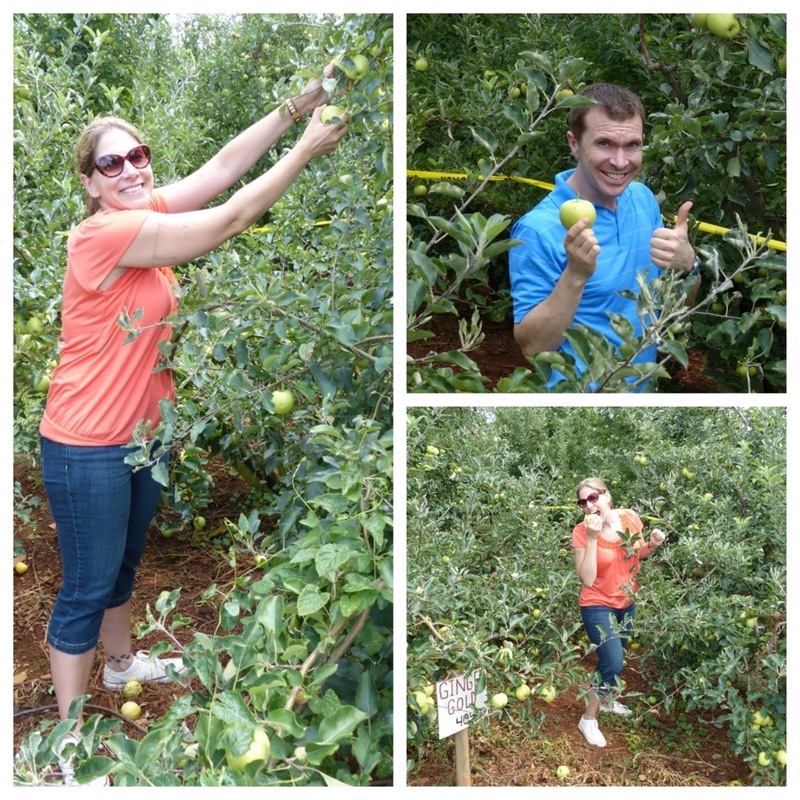 I had never gone peach picking before and it sounded like a really fun thing to do. 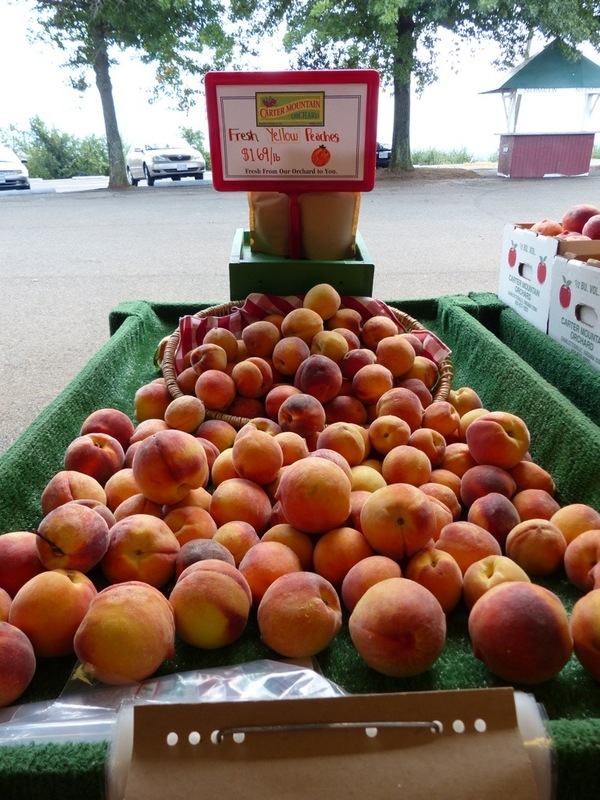 Only problem was all the peaches had already been picked off the trees. We were too late for peach picking, unless picking them from here counts? But we were just in time for apple picking and that was something else I had never done before. Once our apple selections were complete, we headed to the barn where they have lots of delicious treats. A bakery full of pies and cider donuts. 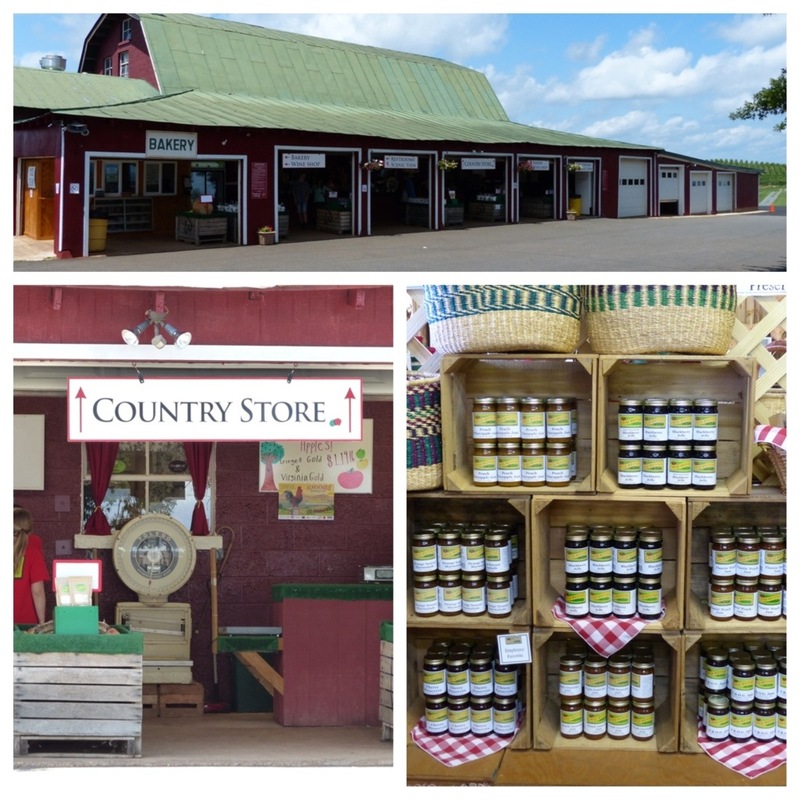 And the country store full of preserves and other fruity goodness. We indulged in some peach cider donuts and they were worth it! 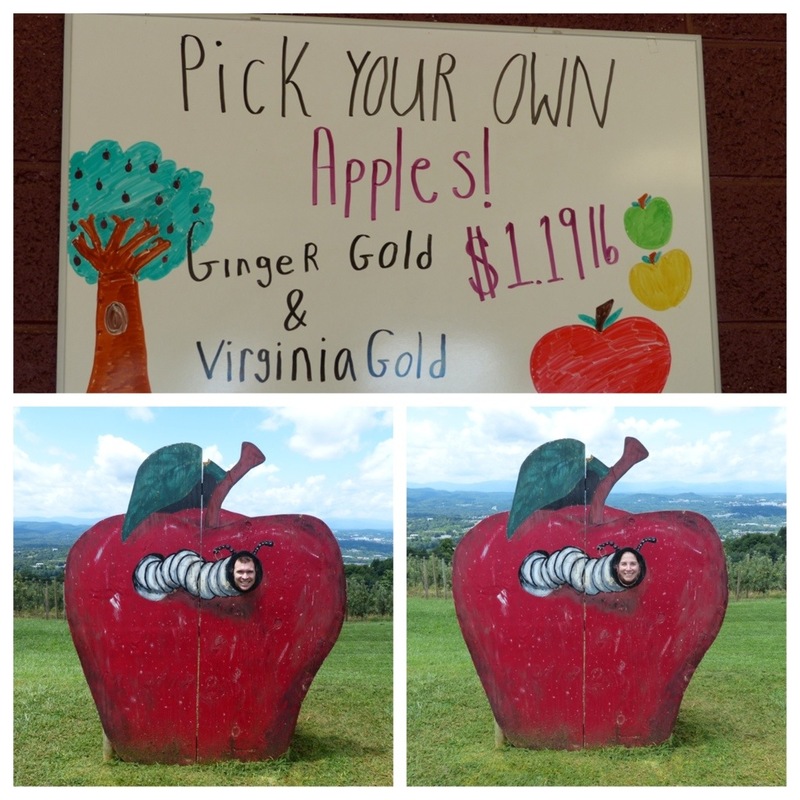 There are many orchards in Charlottesville, and while this one is the only one I have ever been to, I would highly recommend it based on the beautiful scenery alone! And the cider donuts don’t hurt either! Posted on August 19, 2013 by Dayna B. When Jefferson referenced his “garden” in written records, he was usually referring to his vegetable garden. 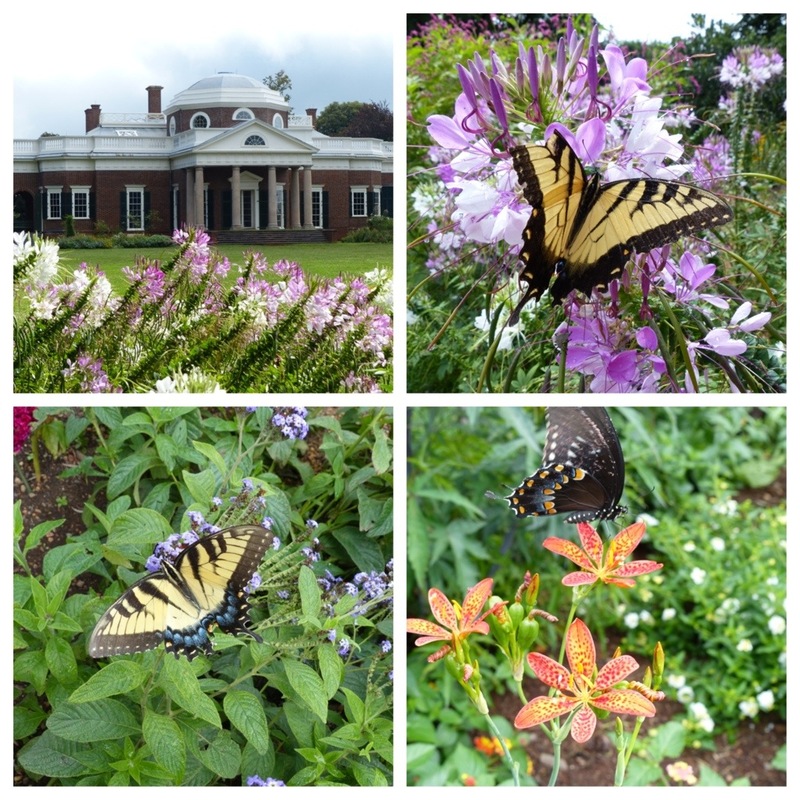 While the flower gardens of the West Lawn are lovely, they are miniscule in comparison to Jefferson’s vegetable garden. 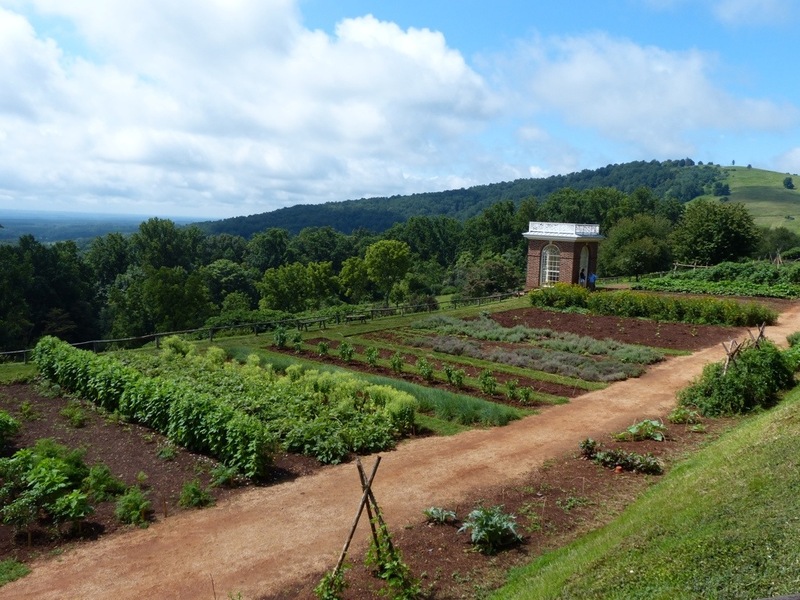 Monticello’s terraced vegetable garden is 1,000 feet long and the 19th century garden has been restored by referencing the meticulous notes of Jefferson’s Garden Book. Jefferson grew about 330 varieties of vegetables and herbs and today the garden serves as a seed bank to preserve 19th century vegetable varieties. Today, the vegetables in the garden are labeled according to the notes found in Jefferson’s Garden Book. 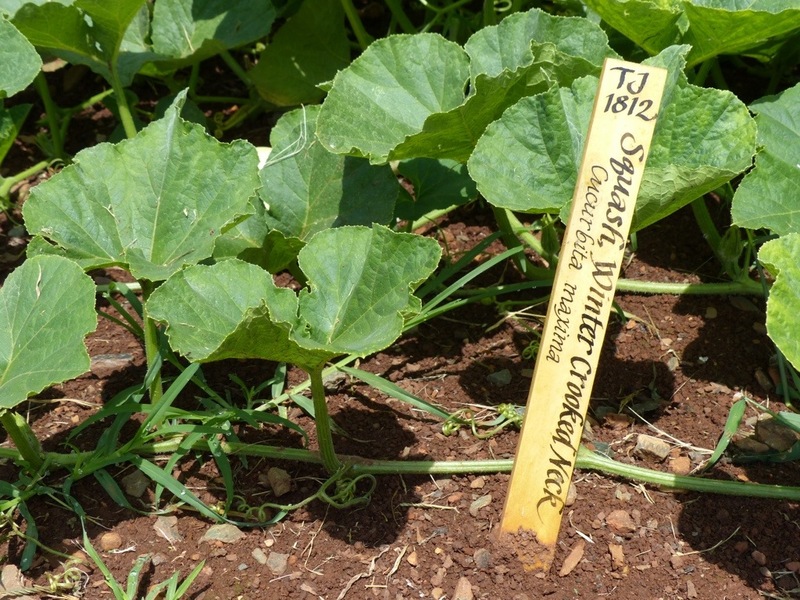 The stake marking this squash variety is marked “TJ 1812” which means it was first referenced in Thomas Jefferson’s Garden Book in 1812. 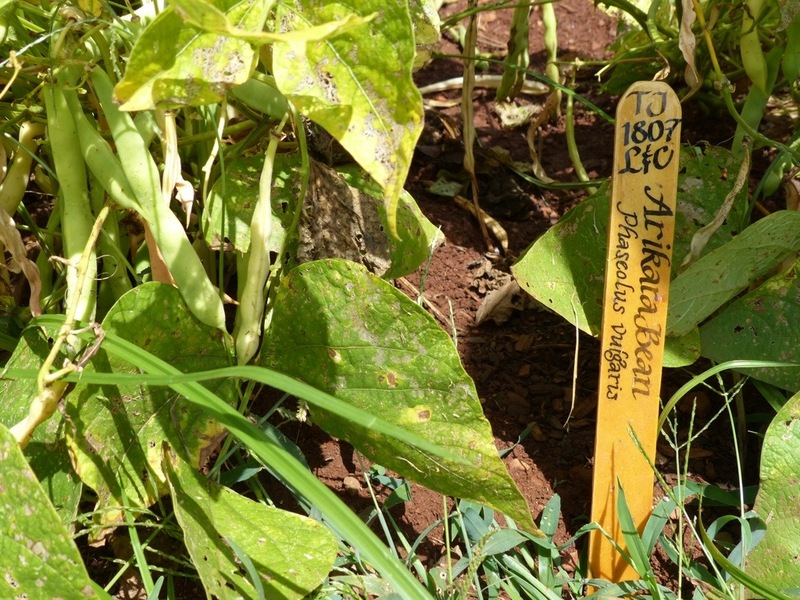 The stake marking this bean variety is labeled in a similar manner, but also shows “L&C” below the year. This means that this vegetable was brought back from the Lewis and Clark Expedition and planted in Jefferson’s garden in 1807. Jefferson’s presidency is most known for the Louisiana Purchase as well as the Lewis & Clark Expedition. In addition to adding vegetables to his garden, Jefferson also had many expedition “souvenirs” throughout his home that were brought back by Lewis & Clark. 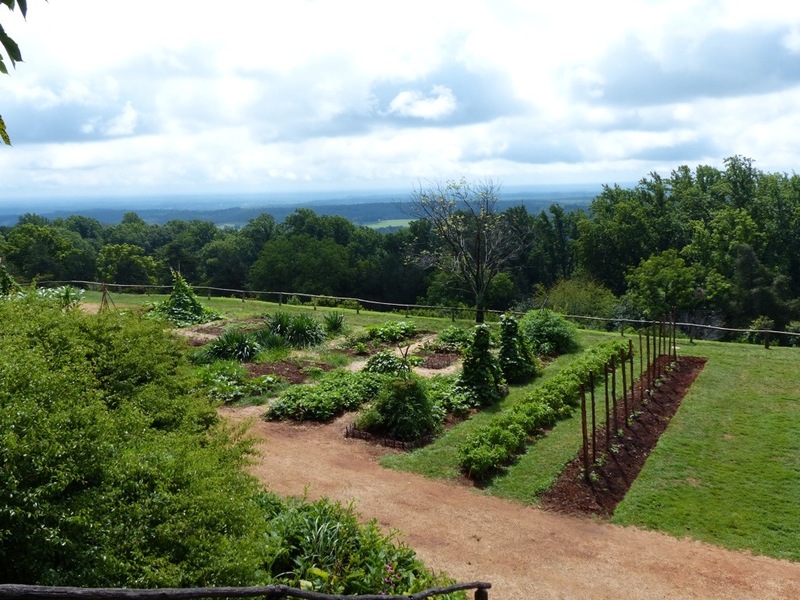 There are also other vegetables currently growing at Monticello that were never recorded in Jefferson’s Garden Book. 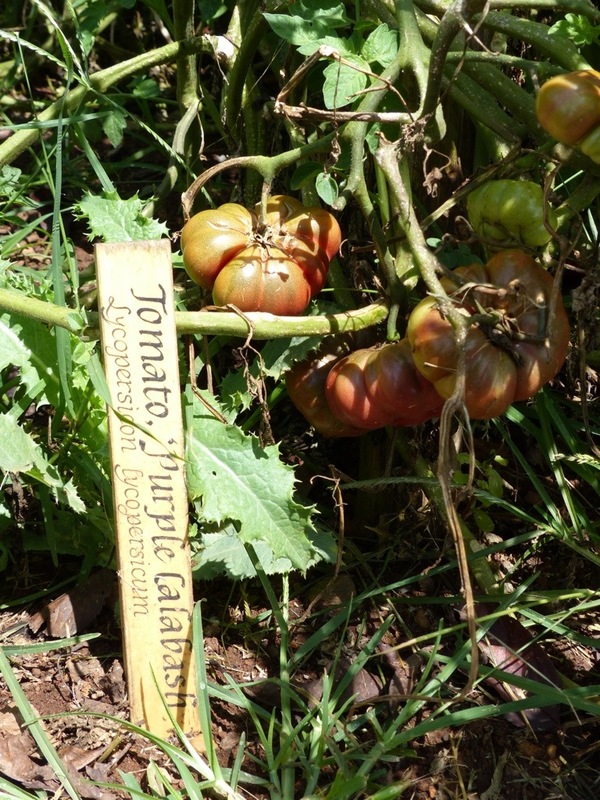 This tomato plant for example, does not have his initials and/or a year marked on the stake, but it is believed that it was likely planted in Jefferson’s garden based on what vegetables were commonly planted in the region at that time. The garden pavilion sits in the middle of the garden and overlooks the eight-acre orchard, vineyard and berry plots. Jefferson used the pavilion as an evening reading location. Thomas Jefferson was one of America’s original wine enthusiasts after serving as Minister to France. 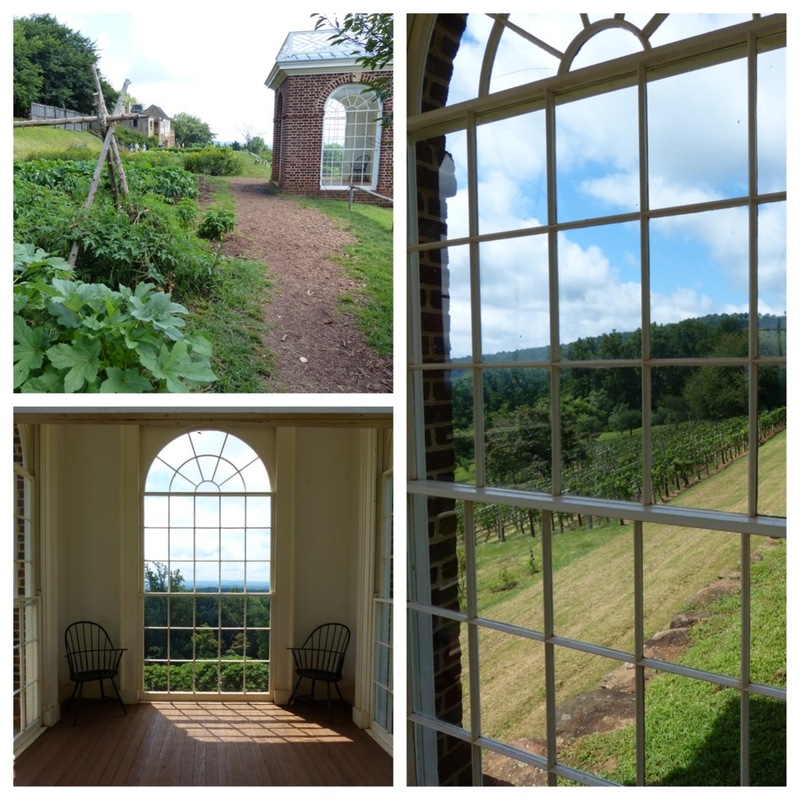 He was committed to growing European varieties of grapes at Monticello with the hopes of making his own wine. He never succeeded. Before the development of modern pesticides, these European varieties were extremely susceptible to local pests that killed the crop. 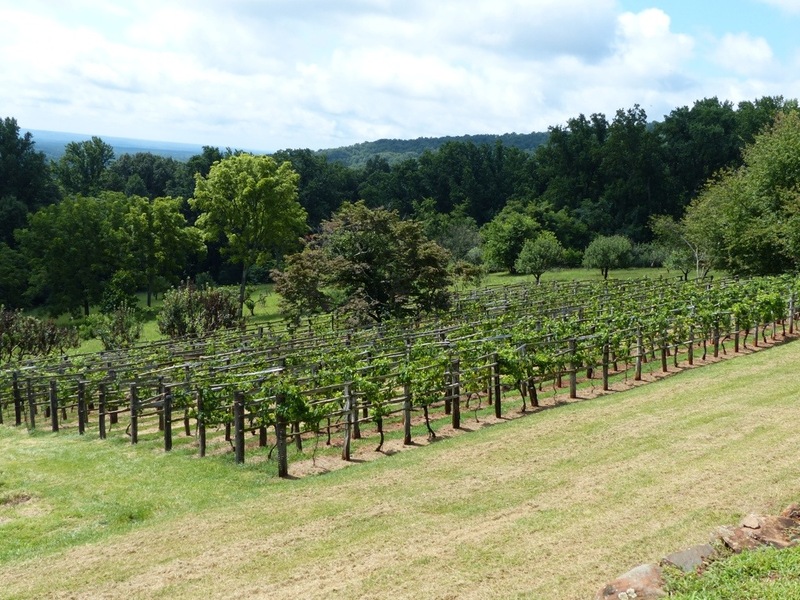 However, Jefferson’s vision did lead to a successful wine market in Virginia. 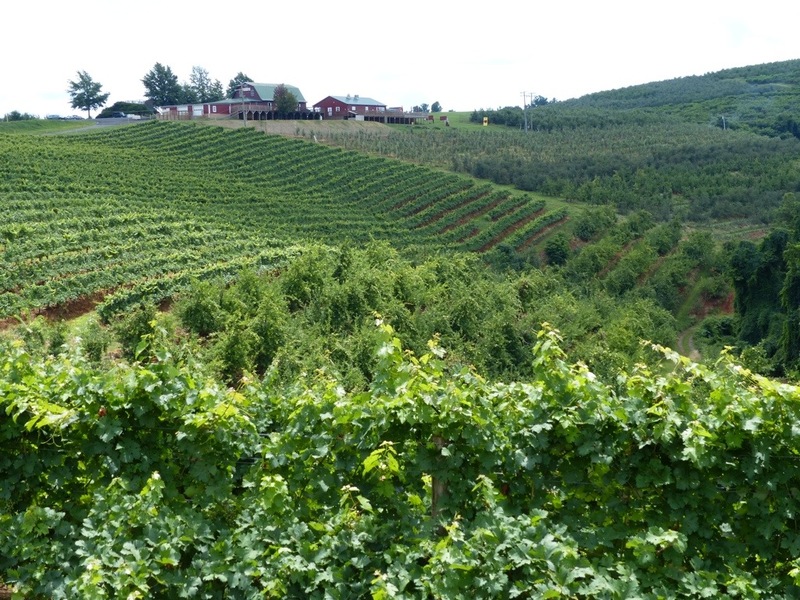 Today, Virginia ranks 5th in the country for the number of wineries and production of wine. And while it didn’t happen in Jefferson’s lifetime, Monticello successfully bottles about 1,000 bottles of wine every year. 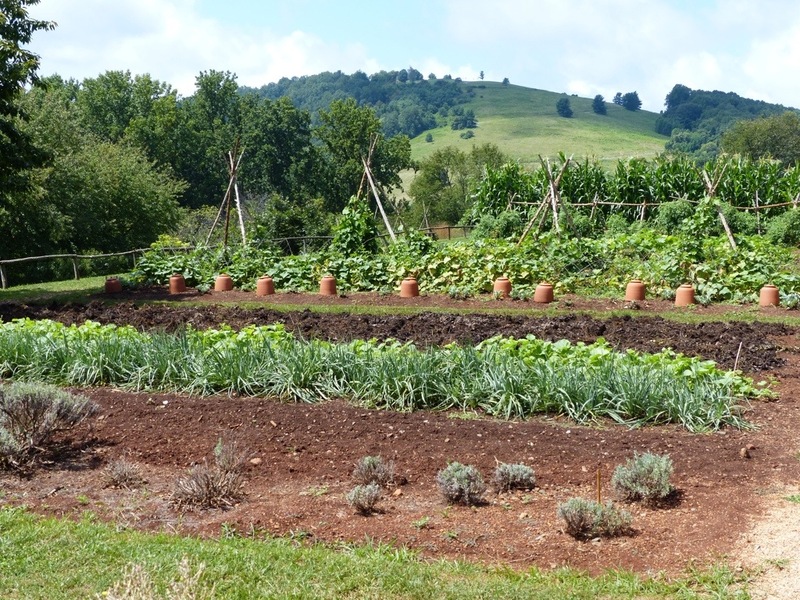 Today, the vegetables and fruit grown at Monticello are used at their tasting events, served at the Café at Monticello, or distributed to employees. Posted on August 16, 2013 by Dayna B.
Thomas Jefferson spent much of his life involved in a variety of public service positions and his life was full of notable achievements. Undeniably, Jefferson’s greatest achievement was drafting the Declaration of Independence. To see a brief timeline of his life and other achievements, click here. 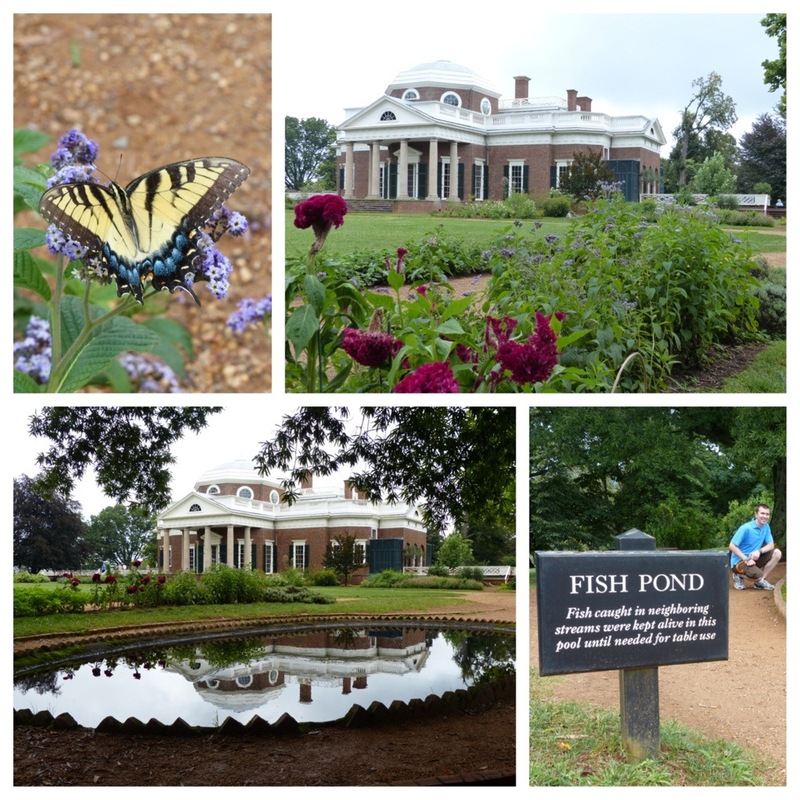 Despite his very full schedule, Jefferson managed to find the time to design every aspect of Monticello; a project that he continuously updated and modified over a period of 40 years. He was a self-taught architect and began building Monticello when he was 26 years old after inheriting the land from his father. The house is situated on the summit of an 850 foot high peak in the Southwest Mountains. The name Monticello derives from Italian meaning “little mount.” Visitors are shuttled to the front entrance at the top of the mountain. No pictures were allowed to be taken inside the home, but if you would like to get a glimpse of the interior rooms, click here. The view of Monticello from the West Lawn (rear of the house) is more famous than the view of the front of the home. The West Lawn is vibrant with beautiful gardens and butterflies galore. There is also a fish pond that was more function, than decoration. Fish were caught in nearby bodies of water and then “stored” in the fish pond until needed. A fabulous idea for an era before refrigerators! Jefferson was always very outspoken about his views against slavery. However, he owned more than 600 slaves in his lifetime. He inherited about 175 slaves and the numbers naturally increased by the procreation of enslaved families. Jefferson purchased fewer than 30 slaves during his lifetime, which still seems like a lot to me for someone so outspoken about the abolition of slavery. But it is reported that he purchased these “few” based on labor needs and also to unite spouses. A fascinating aspect of Jefferson’s design of Monticello was the incorporation of hidden “dependencies.” Dependencies were necessary service rooms that remained accessible to the family and the slaves that worked there, but they were not visible to the public or even guests visiting the home. Two wings connected by an underground passageway provided the work spaces for the slaves that maintained the household. 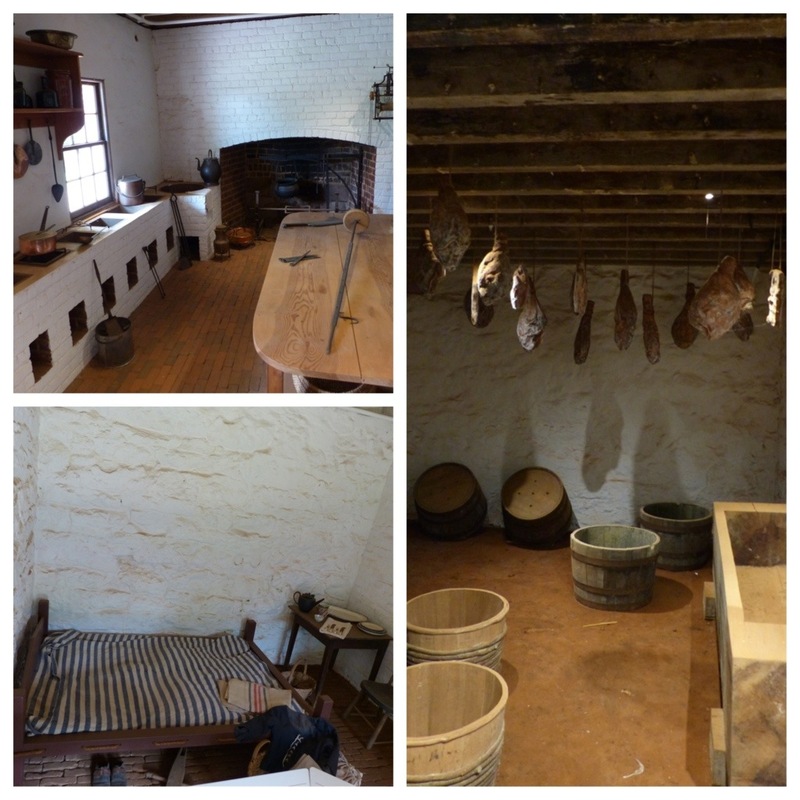 The kitchen, smokehouse, carriage bays, ice house, etc. were all connected to the home for easy access, but remained well out of public view. 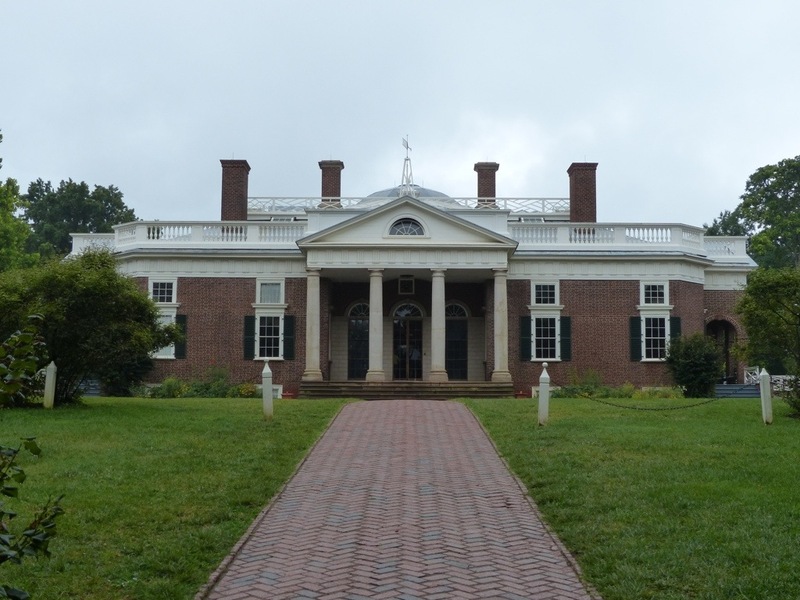 Did Jefferson have a guilty conscience for owning slaves, thereby designing his home in such a way to mask his contradiction? My favorite part was the wine cellar fully equipped with a dumbwaiter that lifted wine directly to a hidden compartment in the fire place of the dining room! 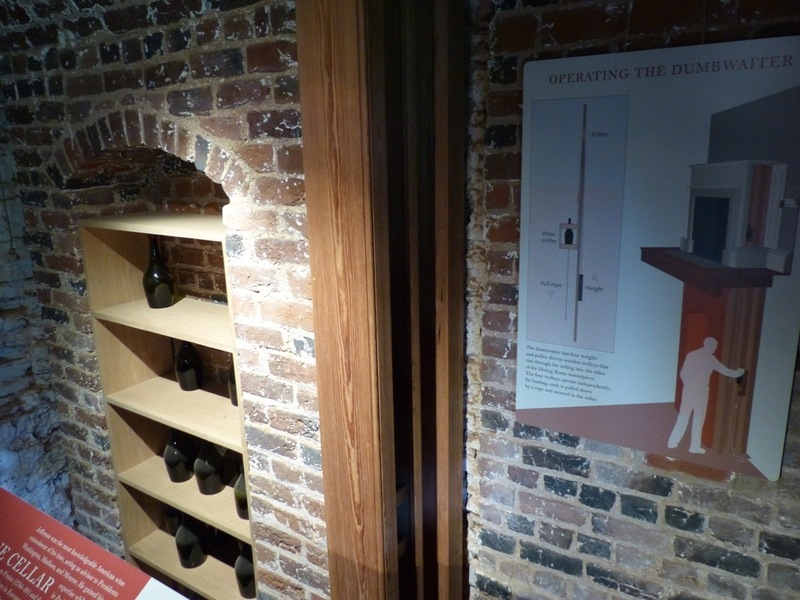 While Jefferson was hosting a dinner with guests he would simply send the empty bottle down in the dumbwaiter and that was the signal for the slave in the wine cellar to promptly replace it. Now of course I am NOT an advocate of slavery. But I AM an advocate of speedy wine replenishment! Pure genius. 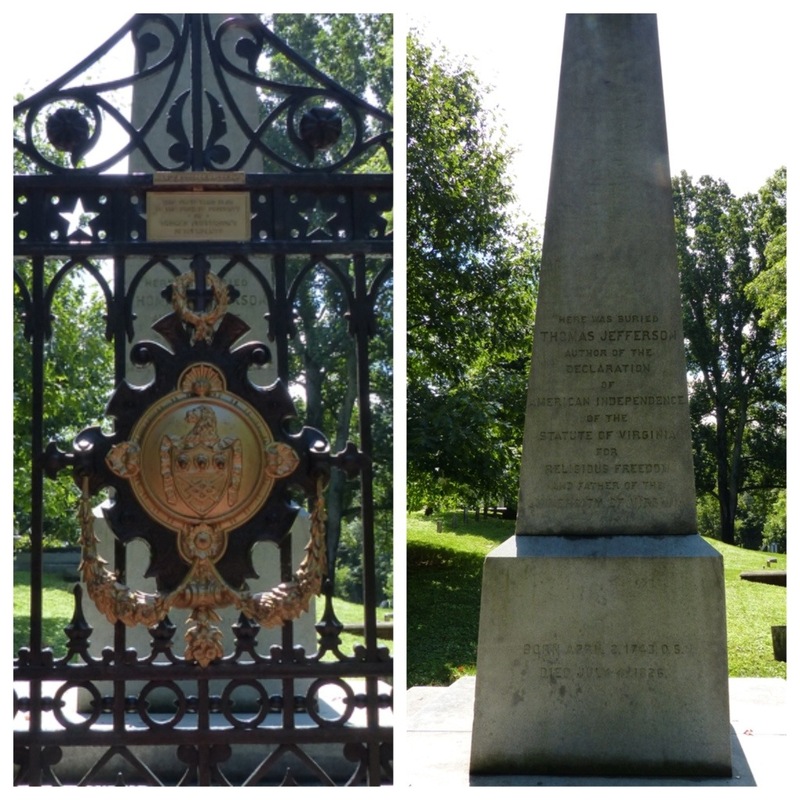 Thomas Jefferson chose his grave site at Monticello and he also wrote the epitaph for his tombstone. “Author of the Declaration of American Independence, of the Statue of Virginia for Religious Freedom, and Father of the University of Virginia.” It is said that these are the accomplishments that Jefferson was most proud of and what he wanted to be remembered for. Some might wonder why becoming a U.S. President didn’t make the cut. But Jefferson wanted to be remembered for what he gave to the people, not what the people gave to him. Jefferson died on July 4, 1826, exactly 50 years after signing the Declaration of Independence. Posted on August 15, 2013 by Dayna B. Rob and I wanted to stay at a cozy B&B during our stay in Charlottesville. 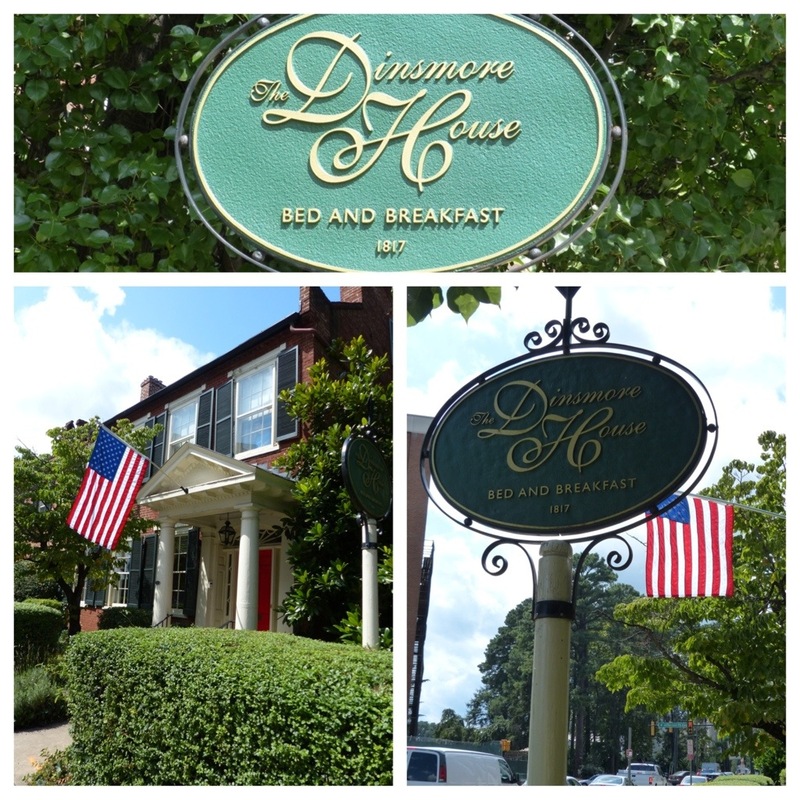 We chose to stay at the historic Dinsmore House Inn in the heart of Charlottesville. This charming B&B is conveniently located one block from the University of Virginia and only 5 miles from Monticello. The home was built by James Dinsmore in 1817. Dinsmore was Thomas Jefferson’s master builder and his monumental construction achievements include Monticello, Montpelier, and the University of Virginia. The inn was absolutely beautiful and I couldn’t have been more pleased with our accommodations. 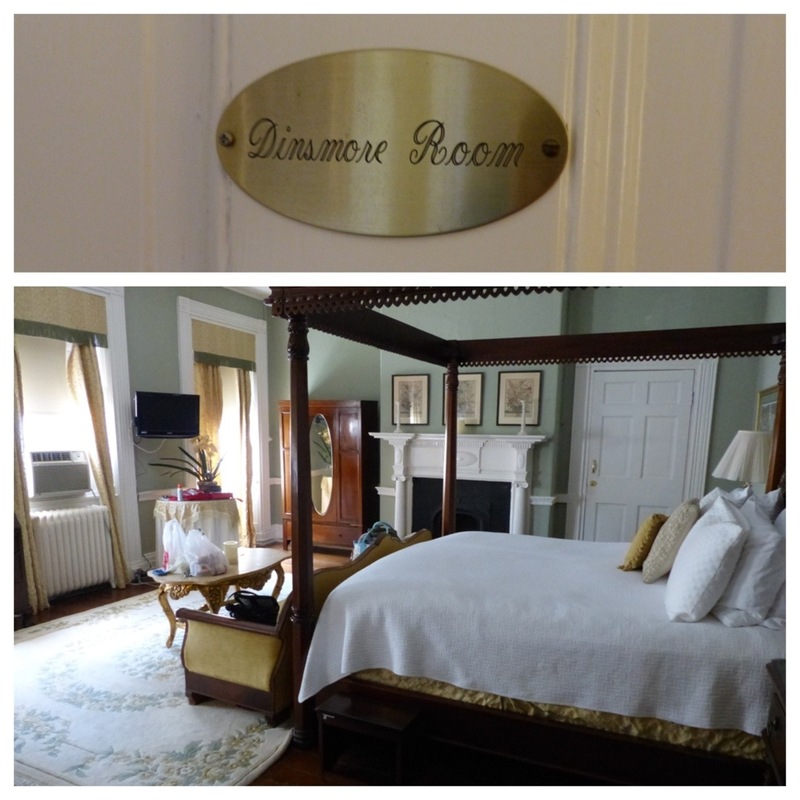 There are 8 guestrooms available and we stayed in the Dinsmore Room. The room was gorgeous and I couldn’t believe how large it was. Despite having a four-poster king-size bed, there was still an incredible amount of space in the room. 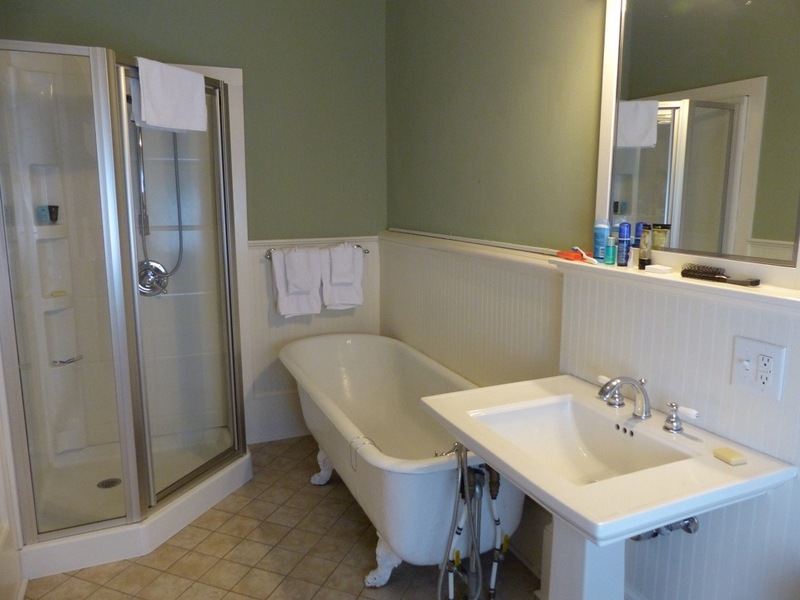 The bathroom was also very nice with a large claw foot tub as well as a separate shower. Every morning they serve a full complimentary breakfast. The meals we had were fabulous! 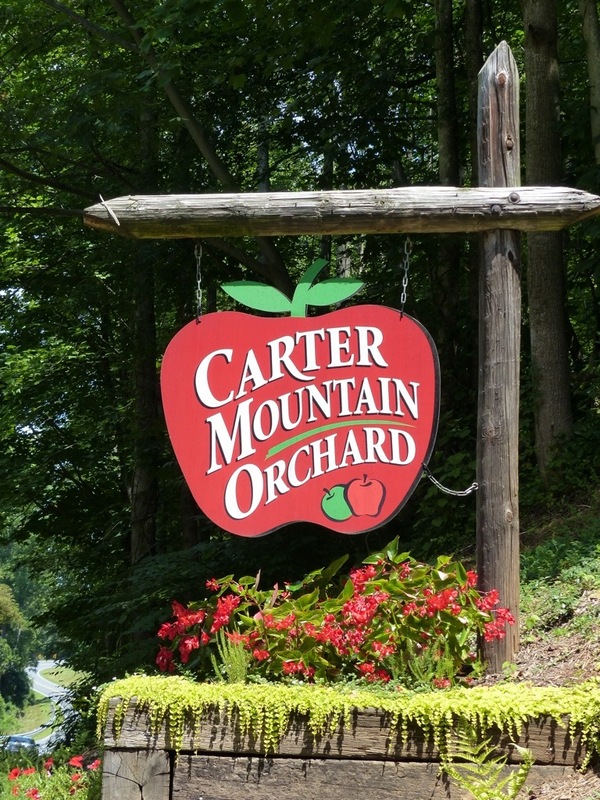 Delicious dishes with fresh, local fruit, homemade English muffins, and even their very own homemade preserves. The preserves were actually the BEST I had ever had! S.E.R.I.O.U.S.L.Y.!! A delicious concoction of figs, apple and pear, oh my! The owner was very accommodating about dietary restrictions and made sure that everything was to our liking. 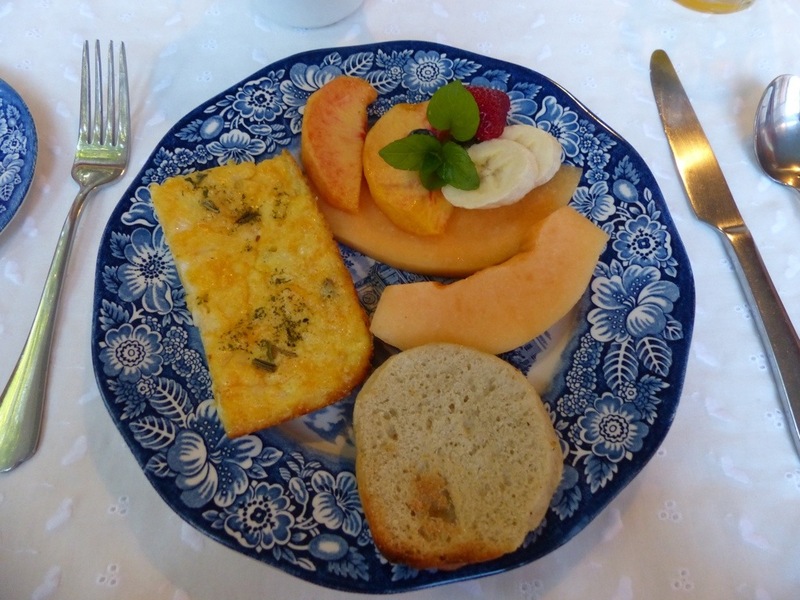 In addition to the breakfast, the inn also hosts an afternoon social every day in the parlor offering light refreshments and a complimentary glass of wine or tea. I think it goes without saying here that I skipped the tea and went straight for the wine! As if that wasn’t hospitality enough, the inn always keeps a stocked refreshment station on the breakfast porch where guests can help themselves to free snacks, soft drinks and water. We thoroughly enjoyed our stay at the Dinsmore House Inn. If you ever find yourself in the Charlottesville area and in need of a good B&B, I would definitely recommend this location. Posted on August 14, 2013 by Dayna B. Rob and I recently planned a little getaway to Charlottesville, VA. Charlottesville is a charming little city about 100 miles south of Washington, DC. The area is rich in history and offers tourists a wide variety of things to do and see. 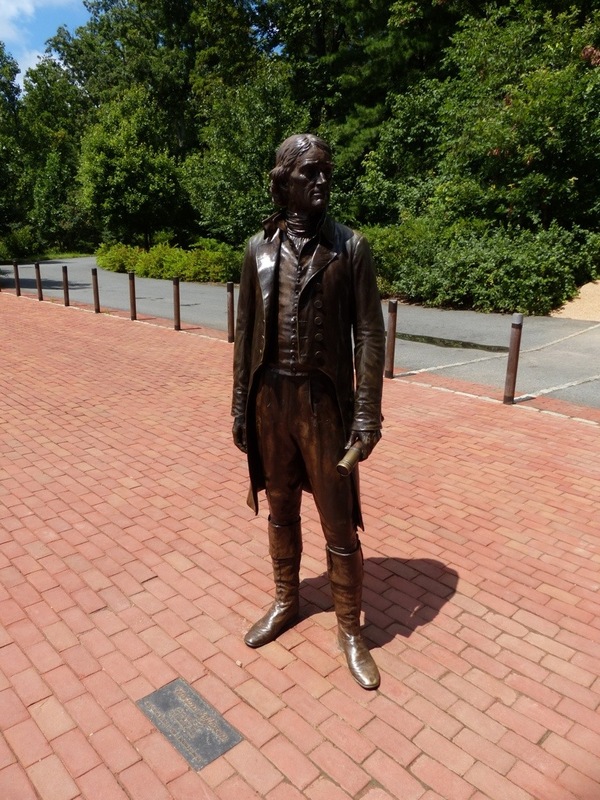 Charlottesville and neighboring Albemarle County were home to three of our founding fathers that later became our 3rd, 4th and 5th Presidents (Jefferson, Madison, & Monroe – to save you the effort of having to Google it!). Of those 3, Thomas Jefferson definitely had the greatest impact on our nation and his spirit remains very much alive in Charlottesville! Everywhere you turn in this region, you are reminded of one of the world’s most important historical figures.